Jeevanpran Shree Muktajeevan Swamibapa established the Headquarters of Shree Swaminarayan Gadi Sansthan, Shree Swaminarayan Mandir, Maninagar and installed the divine murti of Shree Ghanshyam Maharaj on Samvat 2000 Falgun sud 3, Saturday 26th February 1944. The Hirak Jayanti (Diamond Jubilee), 60th anniversary, of this auspicious event will be celebrated with great honour and ceremony. The true abode of Sarvavatari Purna Purushottam Lord Swaminarayan. The heart of the Swaminarayan Karan Satsang. 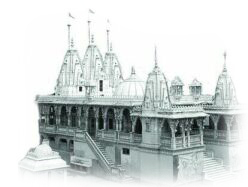 The headquarters of Shree Swaminarayan Gadi Sansthan. The source from which the true, unadulterated principles of Lord Swaminarayan and Jeevanpran Shree Abji Bapashree are spread throughout the world. The fountain from which the supreme tenets of Lord SwaminarayanBapa Swamibapa flows. The origin of true upasana towards Lord Swaminarayan. The gateway through which religious devotion and service reaches the divine lotus feet of Lord Swaminarayan. 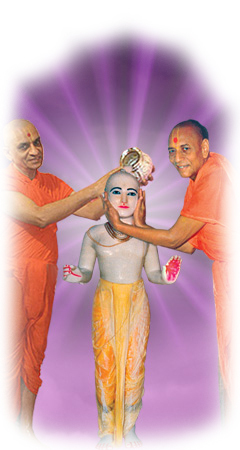 Lord Swaminarayan Himself established the supreme Swaminarayan Satsang on this earth. As time went on, an increasing number of people had begun to misinterpret the principles of Lord Swaminarayan to suit their selfish and egotistical motives. The true, supreme teachings of Lord Swaminarayan, so eloquently taught by Jeevanpran Bapashree, were being erased from all existence. To overcome these obstacles to worshipping the Lord, Sadguru Shree Ishwarcharandasji Swamibapa decided that it was time to establish a separate Centre. From here, the true supremacy of Lord Swaminarayan could be freely understood and the teachings of Jeevanpran Bapashree could be preserved. Lord Swaminarayan's true disciples could pray in peace and harmony. Jeevanpran Shree Abji Bapashree created the Satsang Mahasabha for the reformation and protection of the religious and administrative affairs of the Satsang. Sadguru Shree Ishwar Bapa decided that is was time to establish a permanent home for the Satsang Mahasabha. To fulfil all these reasons, Sadguru Shree Ishwar Bapa inspired the creation of the Maninagar Headquarters.